African Environments has spent 30 years testing out the best quality mountain equipment, keeping up to date on technologies as well as staying true to what works well for the Kilimanjaro conditions. Having quality, especially designed equipment ensures our expeditions run smoothly and that are clients and staff are as comfortable as possible. 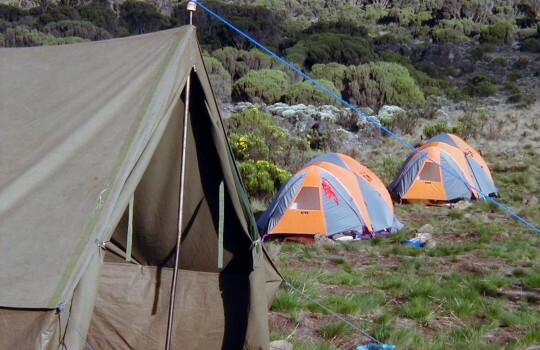 The sleeping tents are hi-tech three man dome tents made by “Mountain Hardware.” These tents have proven to be totally waterproof in rainstorms and are able to withstand the high winds often encountered on Kilimanjaro. Although the tent is designed for three we normally house two, ensuring plenty of space. Each group has its own storm-proof heavy duty Mess Tent that is equipped with tables and stools. Meals are served in the Mess and it is also a nice place to “hang out” and drink tea or coffee, play cards or get to know your group if bad weather should keep you indoors. The camp crew will break camp after the group has departed in the morning then race on ahead of the climbers to have the camp set up by the time you arrive in the afternoon. A welcoming cup of tea is usually ready when you arrive. On average there are four porters for every one client. The porters carry all the group gear: kitchen, Mess Tent, food as well as your personal gear that is not needed for the day’s hikes. African Environments provides portable chemical toilets and tents throughout the climb for personal comfort and privacy. Staff members are dedicated to the role of carrying these items the entirety of the expedition and keep the toilets clean to the highest of standards. Although we recommend clients bring anti-bacterial gel on the expedition this is also provided in the toilets. The menu for all climbs are specially prepared to provide a balanced diet of fresh fruit, vegetables, plenty of protein and carbohydrates. We have tried to choose food items that are not too difficult to digest at high altitude. Our cooks undergo extensive training and we have ongoing bi-annual workshops to review menus. The cooks are particularly vigilant in their hygiene practices as contracting stomach bugs is common for visitors to the developing world. We recommend that everyone follows the hand washing procedures before meals as well as bringing their own personal anti-bacterial gel as a secondary precaution. African Environments breakfasts consist of eggs of your choice, pancakes, hash browns, porridge, bacon or sausages, beans for additional protein particularly for vegans or vegetarians. We make bread in our office kitchen for the climb and can cater for gluten intolerant guests. We also make our own granola, offer fresh fruit as well as dried fruit throughout the climb. Tea, coffee and hot chocolate is available throughout the climb for breakfast, lunch and dinner to help with hydration and replace sugars lost during the day’s hike. Dinners are typically a main course with vegetable and salad. Chicken and fish are served at the beginning and end of the climb, with pastas and rice dishes being served in the middle of the climb while up high. Lunches are often on the trail and usually consist of cold cuts, cheeses and vegetables laid out on a table so you can make your own sandwich. Fresh hot vegetable soups are served for lunch and dinner as well sweet foods like cakes, slices and muffins. 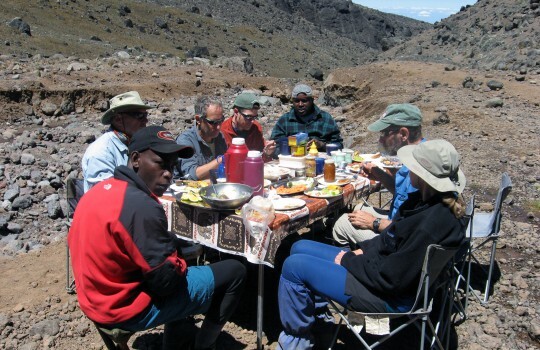 African Environments is dedicated to offering a wide variety of fresh and healthy foods that give our guests the energy they need to conquer Africa’s highest peak! Specific food allergies and preferences can be catered for however if you have a favorite type of tea, chocolate bar or protein shake that you simply can’t live without we suggest you bring this with you from home. Finding some products can still be difficult in Tanzania.